David Ben-Gurion (1886-1973) was the chief statesman and political leader of the modern State of Israel. As Israel's first prime minister, Ben-Gurion led the country during the War of Independence and, except for a two-year period from 1953-1955, served as premier from 1948 to 1963. Ben-Gurion immigrated to Israel in 1906 and was involved in the creation of the first agricultural workers commune, which would later evolve into the modern kibbutz. He also helped form the Jewish self-defense group Hashomar ("The Watchman"). In 1912 he moved to Turkey and attended Istanbul University's Law School. There he adopted the Hebrew name Ben-Gurion, after the medieval historian Yosef Ben-Gurion. In early 1915, the Ottoman authorities ruling Palestine deported Ben-Gurion, citing his political activities were dangerous. Ben-Gurion settled in New York City, where he met Paula Munweis. The two were married in 1917, and had three children. In 1918 he joined the British Army as part of the 38th Battalion of the Jewish Legion and found his way back to Palestine. Ben-Gurion's alma mater party of Poalei Zion split in 1919, with him and his friend, Berl Katznelson, forming Poalei Zion Right – the rightist faction of the Labor Zionist movement. In 1920 he became one of the forces behind the foundation of the trade unions in Israel and the Histadrut Labor Federation, subsequently becoming its chairman. 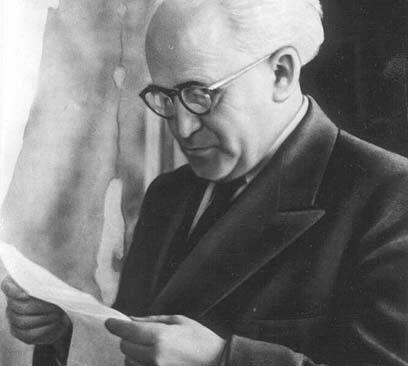 In 1930, Poalei Zion Right and the Left's Achdut Ha'avoda Party joined forces to create Mapai, the right-wing Zionist labor party, under Ben-Gurion's leadership. 1935 saw Ben-Gurion become chairman of the executive committee of the Jewish Agency for Palestine, a role he kept until the State of Israel was formed in 1948. Ben-Gurion was instrumental in leading the struggle for the induction of the State of Israel. He declared the establishment of the State of Israel on May 14, 1948, stating that the new nation would "uphold the full social and political equality of all its citizens, without distinction of race, creed or gender." As Israel's first prime minister, he was who ordered all the armed Jewish groups unite under the banner of the national army the Israel Defense Forces. At the end of 1953, Ben-Gurion retired from political life to the Negev kibbutz of Sde Boker. The 1955 general elections, witnessed his return to politics, as he became prime minister and defense minister once more. 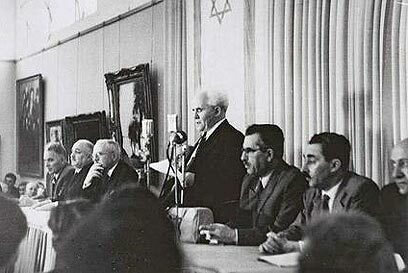 In 1965, the ruling Mapai Party split, with Ben-Gurion establishing the Rafi Party, which went on to win 10 Knesset seats in the 1968 general elections. In 1968, Rafi joined Mapai and Achdut Ha'avoda to form the Labor Party, but Ben-Gurion formed yet another new party – "Hareshima Hamamlachtit" (The State List) – which went on to win four seats in the 1969 elections. The following year Ben-Gurion retired from political life and returned to Sde Boker where he passed away in 1973. Israel's international airport – the Ben-Gurion International Airport – as one of its major universities – Ben-Gurion University of the Negev – were named in his honor. "Israel has created a new image of the Jew in the world - the image of a working and an intellectual people, of a people that can fight with heroism."